THE LAST defenders of the caliphate grazed like sheep until there was no grass left to eat. America bombed from above. Kurdish-led fighters pursued them on the ground. And Syrian and Iraqi armies maintained a siege from their respective positions across the Euphrates river and Iraqi border. Less than five years after it had proclaimed a caliphate the size of Britain, the realm of Islamic State (IS) has shrunk to less than a square mile in a riverside hamlet, Baghuz al-Fawqani, on Syria’s border with Iraq. A few hundred fighters continue the battle, but as The Economist went to press, the American-led coalition was already erecting a podium for victory celebrations nearby. The oilfields and archaeological sites that IS had looted to finance the world’s most powerful jihadist movement provide a backdrop. Its hospitals and police stations lie in ruins. Some 35,000 people, including about 3,000 fighters, have fled. Many of those who were captured are foreigners, who lacked the local connections to slink away undetected. Yet the defeat of this caliphate will not kill the dream of one. Sunni Muslims, who once flocked to its banner, still feel economically and politically oppressed in Syria and Iraq. But Sunnis have paid a high price for the rule of IS and it will find it hard to rally them again. The tens of thousands of Muslims from around the world once drawn by its success have fled in the opposite direction. Even other jihadist groups do not want them. Hayat Tahrir al-Sham (HTS), an offshoot of al-Qaeda and now the leading jihadist force in Syria, has shunned an American offer to allow IS fighters to flee into their territory in Syria’s north-western province of Idlib. HTS leaders crave respectability and fear being tarnished by association with IS. Moreover the presence of IS fighters could invite more bombing by Syria’s patron, Russia. What is left of IS will also find it harder to find ungoverned places to fill. Iraq’s army and Hashd al-Shaabi, or Shia-led militias, control the cities and borders whence IS once sprung. 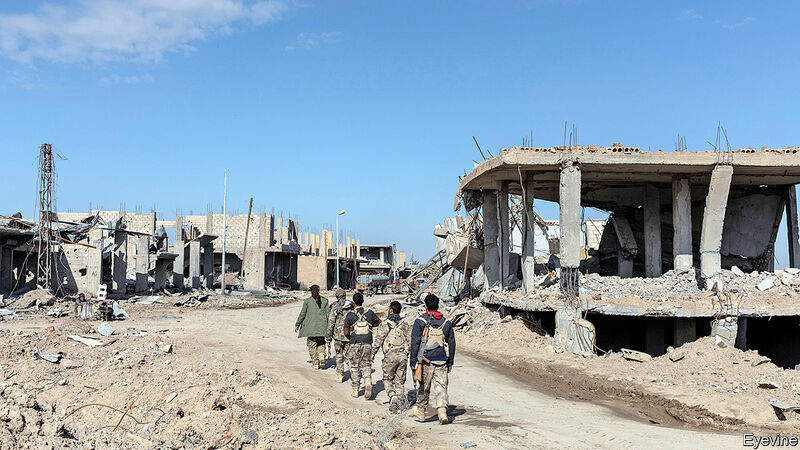 More adeptly than most expected, the Kurdish-led Syrian Democratic Forces have stood up a security apparatus in the quarter of Syria they control. However corrupt and obnoxious Sunni Arabs find them, these forces have proved able to prevent IS from regrouping in large numbers. Raqqa and Mosul, once the caliphate’s largest cities, are devastated, but also quiet. IS is in retreat elsewhere. Egypt’s army has levelled Sheikh Zuweid, the city in Sinai where the jihadists once flew their flag. Libya’s borders remain porous, but IS has lost its Mediterranean stronghold of Sirte. Successive defeats have made it harder to draw fresh recruits. Since a high in 2015, attacks in the West are sharply down. To be sure, IS has had months to plan for a future without territory and to shift weapons and gold. Its fighters still murder village elders, extort money and wage a low-level war of attrition. At night Kurds retreat from their checkpoints into secure compounds. In January IS demonstrated its resilience in an attack that killed 14, including four Americans, near the Turkish border 300km from the front. America’s withdrawal from Syria could also play into its hands. Without American support, Kurdish rule of north-eastern Syria could be challenged. If Turkish and Syrian forces decide to exploit the vacuum and move in, possibly clashing in doing so, the mayhem could again create opportunities for IS to regroup. For the moment, however, the jihadists who once struck fear across the region are broken. Next PostNext Why so glum, China?